Headers and footers are repeated on every page of the document and serve a number of purposes. The use of a line above or below the header or footer, as shown above, may enhance the page attractiveness. The name of the author is very important to protect the copyright of the document. The name of the author can be an organisational name. This means that the copyright is owned by the organisation rather than an individual. It is always amazing as a teacher to receive documents that have no author named. Creators of documents should consider that readers will print, disassemble, reassemble, staple, sort and file the document. There is always a chance that pages can be in the wrong order, or not belonging to the same document, or lost. For these reasons, page numbering and document title is always recommended. Other above-listed headers and footers are optional but can be very helpful. The date of publication not only helps to establish copyright but also helps the author to know which version is the most current. It is a matter of professionalism to add headers and footers to your document. 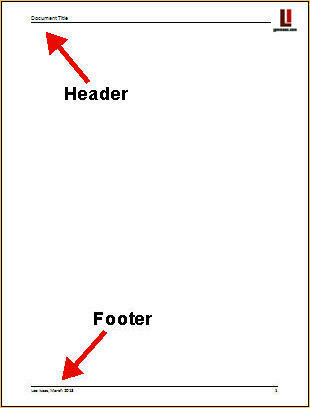 The following is an example of headers and footers in a Microsoft Excel document. 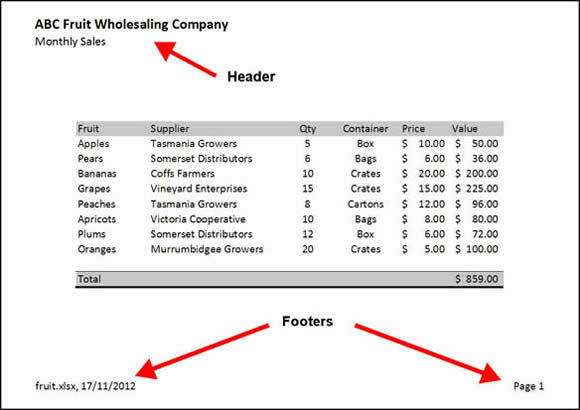 Users of Microsoft Excel should be aware that headers and footers are just as important in Excel as in Word documents. Footers should be unobtrusive and a font size of around 9pt is adequate. The page number can be a little bigger. The document title should be a little larger at 10pt. There really is no need for the the document title to be any larger, if it is going to appear on every page. Microsoft Excel defaults to headers and footers being 1.25 centimeters from the page edge. This is satisfactory for the header but a smaller distance of 0.9 centimeters from the bottom of the page is recommended for footers. You can adjust these settings in Page Setup which you can find on the Page Layout ribbon.